This article is about the protectorate which became independent Botswana in 1966. 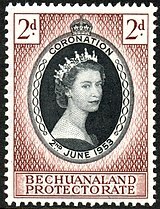 For the 1885–1895 British crown colony, see British Bechuanaland. An 1885 map showing the Bechuanaland Protectorate prior to the creation of the crown colony of British Bechuanaland and the Heligoland–Zanzibar Treaty. The Bechuanaland Protectorate (/bɛˈtʃwɑːnəˌlænd/) was a protectorate established on 31 March 1885, by the United Kingdom of Great Britain and Ireland in southern Africa. It became the Republic of Botswana on 30 September 1966. Scottish missionary John Mackenzie (1835–99), a Congregationalist of the London Missionary Society (LMS), who lived at Shoshong from 1862–76, "believed that the Ngwato and other African peoples with whom he worked were threatened by Boer freebooters encroaching on their territory from the south." He campaigned for the establishment of what became the Bechuanaland Protectorate, to be ruled directly from Britain. Bechuanaland meant the country of the Tswana and for administrative purposes was divided into two political entities. The northern part was administered as the Bechuanaland Protectorate and the southern part was administered as the crown colony of British Bechuanaland. 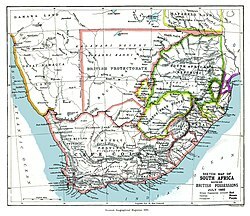 British Bechuanaland was incorporated into the Cape Colony in 1895 and now forms part of South Africa. The northern part, the Bechuanaland Protectorate, had an area of 225,000 square miles (580,000 km2), and a population of 120,776. The British government originally expected to turn over administration of the protectorate to Rhodesia or South Africa, but Tswana opposition left the protectorate under British rule until its independence in 1966. The Bechuanaland Protectorate was technically a protectorate rather than a colony. Originally the local Tswana rulers were left in power, and British administration was limited to a police force to protect Bechuanaland's borders against other European colonial ventures. But on 9 May 1891 the British Government gave the administration of the protectorate to the High Commissioner for South Africa, who started to appoint officials in Bechuanaland, and the de facto independence of Bechuanaland ended. To the south by the line that commences at the mouth of the Orange River and continues up its northern bank to its intersection point with the 20° east longitude. To the east by the line that commences at the aforementioned point and follows the 20th degree of east longitude to its intersection point with the 22° south latitude. The line then traces this degree of latitude eastward to its intersection with the 21° east longitude, follows this degree of longitude northward to its intersection with the 18° south latitude, runs along this degree of latitude eastward to its intersection with the Chobe River. Here it descends the thalweg of the main channel until it meets the Zambezi, where it ends. It is understood that under this arrangement Germany shall be granted free access from its protectorate to the Zambezi by means of a strip of land not less than twenty English miles wide at any point. Great Britain's sphere of influence is bounded to the west and northwest by the previously described line and includes Lake Ngami. British officials did not arrive in the Ngamiland region until 1894. This territory was originally claimed by Matabeleland. In 1887 Samuel Edwards, working for Cecil Rhodes, obtained a mining concession, and in 1895 the British South Africa Company attempted to acquire the area, but three Tswana chiefs visited London to protest and were successful in fending off the BSAC. This territory forms the modern North-East District of Botswana. The most powerful ruler was King Khama III, who had strong support from the British government, and was especially popular among evangelicals in Britain. He collaborated closely with the British military, and kept his vast, but underpopulated lands independent from intruders from South Africa. Khama's eldest son, Sekgoma II, became chief of the Bamangwato upon Khama's death in 1923. Sekgoma II's eldest son was named Seretse. Throughout his life Khama was widowed and remarried several times. One wife, Semane, birthed a son named Tshekedi. Sekgoma II's reign lasted only a year or so, leaving his son Seretse, who at the time was an infant, as the rightful heir to the chieftainship (Tshekedi was not in line to be chief since he did not descend from Khama's oldest son Sekgoma II). [clarification needed] So in keeping with tradition, Tshekedi acted as regent of the tribe until Seretse was old enough to assume the chieftainship. The transfer of responsibility from Tshekedi to Seretse was planned to occur after Seretse had returned from his law studies overseas in Britain. Tshekedi's regency as acting chief of the Bamangwato is best remembered for his expansion of the mephato (regiments) to build primary schools, grain silos, and water reticulation systems, for his frequent confrontations with the British colonial authorities over the administration of justice in Ngwato country, and for his efforts to deal with a major split in the tribe after Seretse married a white woman, Ruth Williams, while studying law in Britain. Tshekedi opposed the marriage on the grounds that under Tswana custom a chief could not marry simply as he pleased. He was a servant of the people; the chieftaincy itself was at stake. Seretse would not budge in his desire to marry Ruth, and he did, while exiled in Britain in 1948. Tribal opinion about the marriage basically split evenly along demographic lines - older people went with Tshekedi, the younger with Seretse. In the end, British authorities exiled both men (Tshekedi from the Bamangwato territory, Seretse from the Protectorate altogether). Rioting broke out and a number of people were killed. Seretse and Ruth were allowed to return to the Protectorate and Seretse and Tshekedi were able to patch things up a bit between themselves. By now though, Seretse saw his destiny not as chief of the Bamangwato tribe, but rather as leader of the Botswana Democratic Party and as President of the soon-to-be independent nation of Botswana in 1966. He would remain Botswana's President until his death from pancreatic cancer in 1980. The story of Seretse and Ruth forms the basis of the 2016 film A United Kingdom. The Bechuanaland Protectorate was one of the "High Commission Territories", the others being Basutoland (now Lesotho) and Swaziland. The High Commissioner had the authority of a governor. The office was first held by the governor of the Cape Colony, then by the Governor-General of South Africa, then by British High Commissioners and Ambassadors to South Africa until independence. Consequently,[clarification needed] administration was headed in each territory by a Resident Commissioner, who thus had approximately the same functions of a Governor but somewhat less authority. Herbert Charles Fahie Cox 1957 ? 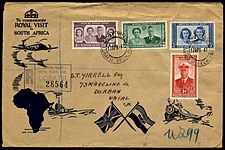 Bechuanaland postage stamps were issued from 1888 to 1966. 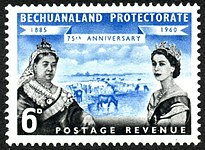 Overprinted stamps were issued until 1932, when the first stamps inscribed "Bechuanaland Protectorate" were issued. On 14 February 1961 the South African rand was introduced, necessitating the surcharging of the existing definitive stamps until new ones were issued. British Bechuanaland, the area south of the Molopo River, now part of South Africa. ^ "Botswana profile". BBC News. 9 August 2012. ^ Mackenzie, John (1887). Austral Africa: Losing It or Ruling It; Being Incidents and Experiences in Bechuanaland, Cape Colony, and England. London: Sampson Low, Marston, Searle & Rivington,- via World Digital Library. Retrieved 19 June 2014. ^ Morton, Fred; Ramsay, Jeff, eds. (1987). The Birth of Botswana: A history of the Bechuanaland Protectorate from 1910 to 1966. Gaborone, Botswana: Longman Botswana. p. needed. ISBN 978-0-582-00584-6. ^ "Builders of Botswana: The Northern Border". Daily News. Botswana. 8 March 2002. Archived from the original on 19 April 2002. ^ "Anglo-German Treaty [Heligoland-Zanzibar Treaty] (July 1, 1890)" (PDF). German History in Documents and Images, Volume 5. Wilhelmine Germany and the First World War, 1890-1918. Washington, D.C.: German Historical Institute. ^ "Builders of Botswana". Daily News. Botswana. 7 September 2001. Archived from the original on 24 February 2002. ^ J. Mutero Chirenje, Chief Kgama and his times c. 1835-1923: the story of a Southern African ruler(1978). ^ Professor Henry Louis Gates, Jr.; Professor Emmanuel Akyeampong; Mr. Steven J. Niven (2 February 2012). Dictionary of African Biography. OUP USA. pp. 355–. ISBN 978-0-19-538207-5. ^ "A United Kingdom". Film. British Council. Retrieved 14 January 2017. ^ "Bechuanaland Colonial Administrators c.1884-c.1965". Retrieved 27 February 2016. Tlou, Thomas; Campbell, Alexander C. (1997). History of Botswana (second ed.). Gaborone, Botswana: MacMillan Botswana. ISBN 978-99912-78-08-7. Harrigan, Walter et al. Report of the judicial enquiry Re Seretse Khama of the Bamangwato tribe (1 December 1949), reproduced in Botswana Notes and Records, Vol 17 (1985), pp 53–64. A rare Bechuanaland Border Police canteen token. "Bechuanaland" . New International Encyclopedia. 1905. "Bechuana-land" . The Nuttall Encyclopædia. 1907. "Bechuanaland" . Encyclopædia Britannica (11th ed.). 1911. Beach, Chandler B., ed. (1914). "Bechuanaland" . The New Student's Reference Work . Chicago: F. E. Compton and Co.
"Bechuanaland Protectorate, The" . The New Student's Reference Work . 1914. "Bechuanaland" . Collier's New Encyclopedia. 1921. Rines, George Edwin, ed. (1920). "Bechuanaland" . Encyclopedia Americana. "Bechuanaland Protectorate" . Encyclopedia Americana. 1920. This page was last edited on 8 April 2019, at 17:04 (UTC).